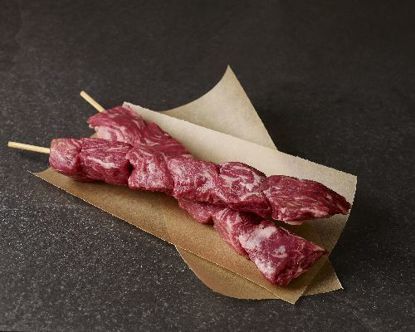 Lobel's Ready-Made Kabobs are not just meat cut into cubes. They're hand-cut into cubes, then threaded onto wooden skewers. Lobel's Ready-Made Chicken Kabobs are not just meat cut into cubes. They're hand-cut into cubes, then threaded onto wooden skewers. Lobel's Ready-Made Kabobs are ready to grill or broil practically right out of the box—just bring them to room temperature first. Choose our seasoned chicken thigh kabobs with flavors of oregano, garlic, black pepper, and olive oil for the fastest kabobs ever. Or choose our unseasoned chicken thigh kabobs and simply coat with sea salt, pepper, and olive or marinate before grilling or broiling. To call Lobel's Ready-Made Kabobs fast food might seem a disservice. The truth is Lobel's Kabobs are great food, conveniently packaged that cook fast. Not only are they absolutely luscious, they're easy to prepare, easy to cook, and oh-so-easy to devour. Lobel's Kabobs come assembled on wooden skewers that have been soaked in olive oil to minimize the potential for flare ups. Within minutes—just 2 to 4 minutes per side, depending on the heat of your grill, you'll be ready to dive into an eating experience of your own making. Try one variety or mix things up with any of our four varieties—beef, lamb, chicken, and pork. Enjoy these kabobs with your favorite sauces or dips. Try lining half a pita with your favorite sandwich vegetables, then slide in a skewer of these kabobs. Finish with a drizzle of extra virgin olive oil. You'll be really glad you did. 4 skewers per 1-pound pack. Misleading You know we love Lobels but it should have been more clear that this chicken was all dark meat. My husband doesn\t like dark meat and we were stuck with $150 of chicken kebab that I would not have ordered.